Oncotarget follows the COPE Code of Conduct and Best Practice Guidelines for Journal Editors and the Code of Conduct for Journal Publishers. Oncotarget follows the COPE general guidelines as well. Editors, authors, and reviewers should all follow the best-practice guidelines on ethical behavior and International Committee of Medical Journal Editor's Recommendations for the Conduct, Reporting, Editing and Publication of Scholarly Work in Medical Journals. - Editors evaluate manuscripts exclusively on the basis of their scientific merit (novelty, technical merit, quality of the data, conclusions based on data, importance for the scientific community, presentation), regardless of the authors’ citizenship, race, gender, sexual orientation, ethnic origin, religious belief, political philosophy or gender, sexual orientation. Decisions to publish are not determined by the policies of governments or any other agencies outside of the journal itself. The Editors-in-Chief have full authority over the entire editorial content of the journal and the timing of publication of that content. - Editors and the editorial staff will not disclose any information about a submitted manuscript to anyone other than the authors (all authors need to be informed), reviewers, potential reviewers, or members of the Editorial Board, as appropriate. - Editors will not use unpublished information for their own purposes. This information will be kept confidential. Editors will evaluate manuscripts in which they have NO substantial conflicts of interest resulting from competitive, collaborative, or other relationships/connections with any of the authors, companies or institutions connected to the papers. The editors ensure that accepted manuscripts have undergone peer-review. The Assistant editors select the experts in the field as the reviewers. After receiving on an average of 3-6 reviews (at least two), Senior Editors and/or the Editor-in-Chief make decisions as to whether the paper must be rejected outright or sent to the authors for revision. After revision, the Editors send a revised article with a detailed response to the reviewers (rebuttal) for their additional comments. If the reviewers consider further revision necessary, then the article is sent back to the authors for a second round of revision. No more than 3 rounds of revision are allowed, after which the Editors must make a final decision. Editors, including Editor-in-Chief, do not participate in the peer review and decision-making processes of their own manuscripts. The Editors will not accept papers that contain defamation, copyright infringement, falsification, fabrication or plagiarism. - Every unethical publishing behavior will be investigated, even if it is discovered years after publication and Editors/Publishers will follow the COPE recommendations. If a simple error or misconduct are confirmed, a correction, retraction, or other note will be published in the journal. - Peer review is an essential and obligatory. Peer review assists editors in making decisions and provides authors with comments that enable them to improve their manuscripts. - Any invited reviewer who feels unqualified to review the research should immediately notify the editors and decline the invitation to review. - All manuscripts received for review are confidential documents; they must not be shown to or discussed with others, except if authorized by the Editor-in-Chief. This also applies to reviewers who decline the invitation. - Reviews should be objective. Comments to authors should help authors improve their manuscript. Personal criticism is inappropriate. - Reviewers should identify relevant published work that has not been cited by the authors. Any statement should have the relevant citation. A reviewer should also notify the editors of any substantial similarity or overlap between the manuscript under review and other manuscripts. - Reviewers who have conflicts of interest should disclose them to the editors to declare their conflicts of interest. The Editors will determine whether the conflict is sufficient to exclude the reviewer from peer-review. - Information in the manuscript should not be used in a reviewer’s (including the reviewers who were excluded based on conflicts of interests) own research. This information must be kept confidential. - Authors should—at the earliest stage possible (generally at the time of submission and including a statement in the manuscript)—disclose any conflicts of interest that might influence the results or their interpretation in the manuscript. Examples include financial ones such as honoraria, educational grants or other funding, employment, consultancies, stock ownership participation in speakers’ bureaus, membership, and paid expert testimony or patent-licensing arrangements, as well as non-financial ones such as personal or professional relationships, affiliations, knowledge or beliefs in the subject matter or materials discussed in the manuscript. All sources of financial support for the work should be disclosed (including the grant number or other reference number if any). - Authors are obliged to cooperate fully by responding promptly to editors’ requests for raw data, clarifications, and proof of ethics approval, patient consents and copyright permissions. In the case of a first decision of "revisions necessary", authors should respond to the reviewers’ comments systematically, point by point, and in a timely manner, revising and re-submitting their manuscript to the journal by the deadline. - When authors discover significant errors or inaccuracies in their own published work, it is their obligation to promptly notify the journal’s editors or publisher and cooperate with them to either correct the paper in the form of an erratum or to retract the paper. If the editors or publisher learns from a third party that a published work contains a significant error or inaccuracy, then it is the authors’ obligation to promptly correct or retract the paper or provide evidence to the journal editors of the correctness of the paper. For guidelines on retracting or correcting articles, please use Elsevier guidelines. Article Withdrawal: Only used for Articles in Advance, which represent early versions of articles and sometimes contain errors, or may have been accidentally submitted twice. Article Retraction: Infringements of professional ethical codes, such as multiple submission, bogus claims of authorship, plagiarism, fraudulent use of data, falsification and fabrication. Article Replacement: In cases where the article, if acted upon, might pose a serious health risk. Article Removal: Legal limitations. This will only occur where the article is clearly defamatory, or infringes on others’ legal rights, or where the article, if acted upon, might pose a serious health risk. Correction: Authors should contact the Editor of the journal, who will determine the impact of the change and decide on the appropriate course of action. 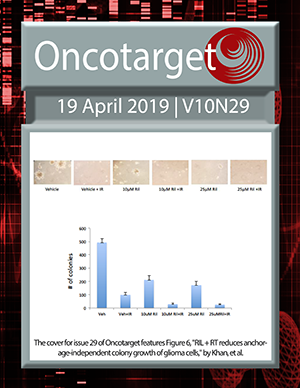 Oncotarget will only publish a correction for the published article after receiving approval and instructions from the Editor. The publisher is involved in handling unethical publishing behavior. In cases of scientific misconduct, plagiarism, or fraudulent publication, the publisher (with the editors) will clarify the situation and take actions, including publication of an erratum, correction, or even the retraction. The publisher with the editors will prevent the publication of fraudulent papers and will not allow misconduct to take place. The publisher is committed to the availability of publications and ensures the content preservation/accessibility by partnering with the corresponding organizations. All Oncotarget content is archived in PubMed Central. The publisher also maintains the journal’s own digital archive.